So what is dpf regeneration? The active regeneration system calculates a dpf filter soot load limit from sensors reading exhaust backpressure before and after the filter itself, activating timing adjustments to the fuel injection and allowing the injectors to fire when the exhaust valves are open allowing diesel to enter the exhaust system above the dpf which in turn increases the exhaust temperature, burning of the soot and regenerating or clearing the filter. Depending on the vehicle brand, This type of DPF regeneration can also be initiated by the vehicle ECU every 400 – 600 kilometres or so depending on vehicle use and takes around 10 minutes to complete. Some manufacturers use passive regeneration. For these vehicles passive regeneration generally takes place on the motorway where exhaust temperatures are higher. This type of system can have an integrated oxidising catalytic converter located close to the engine where exhaust gases are hot enough so that passive regeneration is possible such as BMW and VW. Passive regeneration relies on the exhaust temperature being high enough to automatically burn off, (motorway driving) where temperatures can reach 5-600 degrees. In city driving or short trips the regeneration my not take place fully, because exhaust temperatures struggle to get up to a high enough temperature to burn off the soot loads leading to blocking of the filter. This can lead to higher fuel consumption and a blocked dpf as well and turbo failure. When your vehicles dpf becomes so blocked that Active or Passive regeneration is determined by the pressure differential readings that the level is to high to attempt regeneration the ecu will displays DPF warning lights and it will go in to ‘limp mode and it is essential that the vehicle is brought to us. Continued driving will only increase the soot loads in a very short period of time e.g. 2-5% increase every 20-30 miles and will result in the engine either cutting out or refusing to start. A forced regeneration can sometimes be attempted but by this point many ECU system refuse to allow a forced regeneration or it will not be effective and usually makes things worse. You’ll need us to help you. This will also require changing the engine oil & oil filter. Every vehicle type & engine combination varies and there are differing reasons as to why the dpf blocks. The rate of particulates (soot) generated by the engine, the quality of the fuel, quality of the or oil, driving style, boost leaks, faulty air flow meter, worn injectors even the location of the DPF in the exhaust system can all contribute to the filter blocking or not regenerating fully. Generally, the problems arise in around town stop start driving where the regeneration process might not complete. A warning light will illuminate or a message indicating the DPF is full displays on the dash. If you continue to drive in the same manner, the soot build up will increase until other warning lights illuminate and the vehicle will go into ‘limp’ mode, where driving speed is restricted. Dpf filter block all the time BUT they then go on to clean themselves so when dealing with blocked dpf filters the question should be “why is my dpf not cleaning itself” and you really do need specialists like us to help in this area. If you only use your car around town or for short trips you may experience a faster build up of soot in your DPF as the regeneration process may not complete. Temperature: The DPF relies on temperature to carry out filter regeneration, at around 600c, so a lot of short trips, low speed driving will not provide the exhaust system with a high enough temperature to begin or complete regeneration, so the filter can block up faster. So even when it becomes blocked and the ecu attempts to clear it can’t because the exhaust temperatures are too low. Vehicles with DPF systems that have covered a lot of miles will start to show that filter regeneration is harder to complete and happens more often. Like any part on the car they do wear out and can no longer be repaired. Dpf filters are not guaranteed for life. 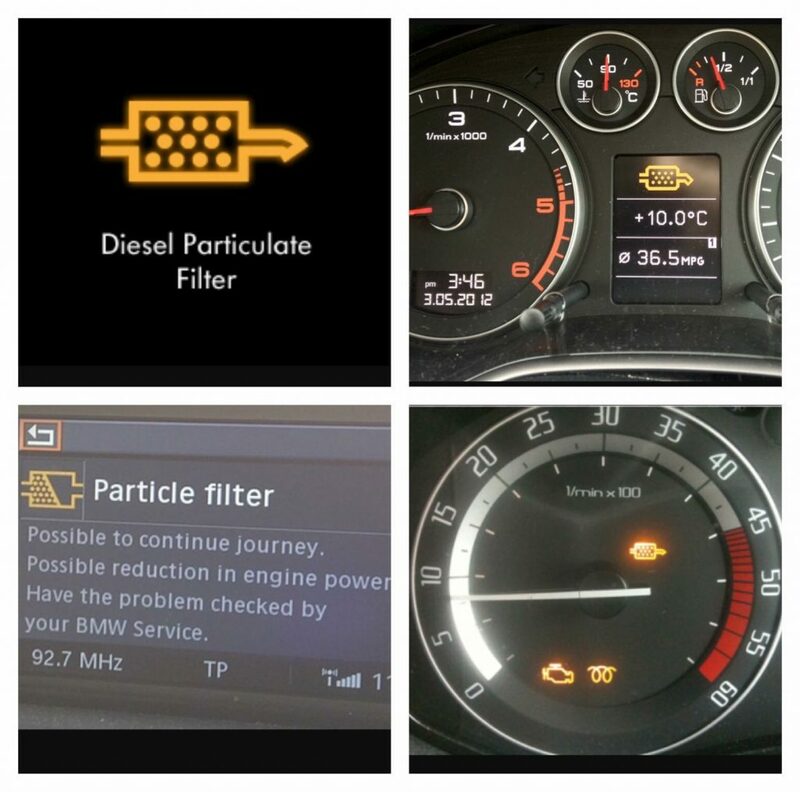 So what should i do when my dpf is blocked ? Call us on 0191-3863422 and we will talk you through your syptoms and solutions.